What possible good could have come out of the Korean War? If you are a North Korean not living in a showcase city like Pyongyang, this might be a tough question. But if you are a Siberian tiger , an Amur leopard or an Asiatic black bear, this question is a no brainer. Since the Korean War, according to thinkquest.org the DMZ, (demilitarised zone) has been almost untouched by human beings. In the total absence of any human presence, an ecosystem has developed that has supported a vastly diverse collection of wild animals and plants. The DMZ Forum describes the area as follows. "The DMZ is 2.4 by 155 miles. It and the contiguous Civilian Control Zone (CCZ) in the Republic of Korea--3-12 miles across the peninsula--contain five rivers and many ecosystem types, including forests, mountains, wetlands, prairies, bogs and estuaries. There are over 1,100 plant species; 50 mammal species, including Asiatic Black Bear, leopard, lynx, sheep and possibly tiger; hundreds of bird species, many of which, according to IUCN, are endangered, including Black-faced Spoonbill, Red-crowned and White-napped Cranes and Black Vulture; and over 80 fish species, 18 being endemic. These species represent 67% of Korea’s fauna. Hundreds of bird species migrate through the DMZ going to and from Mongolia, China, Russia, Vietnam, Japan, the Philippines and Australia". Now, even as North and South Korea are expanding contacts and inching towards greater unity, environmental activists and experts are trying to safeguard one of the few good things to come out of the three year "police action" in which an estimated three million people died. Since then, the North has known famine and brutal repression. At least the South Koreans have moved towards democracy and prosperity. Korea has a multitude of problems. 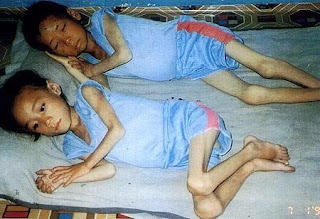 Despite its bloated military, North Korea is never far from starvation. The entire country is built upon worship of Kim Jong Il and his father, Kim Il Sung. The country is built on a caste system with the Communist party at the top and dissidents on the bottom. Entire regions of the country in which the politically unreliable live are closed to the outside world. Occasionally, brave individuals smuggle film out of North Korea showing scenes of starvation and squalor. They do so at the risk of their lives. I can not live with myself if I call attention to the humanitarian crisis in North Korea and make no suggestions of how to help. There actually is an organisation working to help the refugees from North Korea who are spilling over into China. The organisation is called LINK which stands for Liberty In North Korea. They are well worth checking out. North Korea has the world on edge as it brandishes its missiles and nuclear weapons. This is a security matter for the world to deal with. Bit we must not lose sight of the two to three million people who have died in Korea's man made famine. Whatever calm we may achieve through diplomacy or show of strength, there is no peace for the frightened and hungry millions in that country.